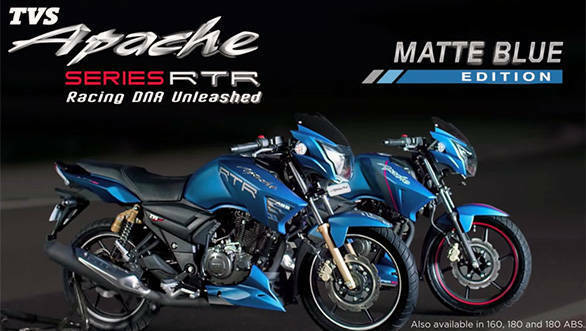 TVS India has launched the Apache RTR with a matt blue paint scheme. This colour will be available to all the Apache variants- the Apache RTR 160, 180 and 180 ABS. With no change in the bike apart from the matte blue paint scheme, it seems like a stopgap measure from TVS as the company is rumoured to be working on a 200cc Apache. This motorcycle is expected to be launched in a few months alongside a four-stroke moped and the TVS Victor. The new TVS Apache should replace the current Apache RTR 180. It is expected that the new Apache with a bigger displacement will produce about 20PS of power and 17Nm of torque and will have ABS as an option. The spied images of the Apache 200cc bike make it clear that it gets a new chassis and a monoshock suspension. The Apache RTR 160 is currently available in five shades- white, grey, black, red and yellow, while the Apache RTR 180 and the 180 ABS offers two tone colours- white and black. The Apache RTR 160cc engine produces 15.2PS/13.1Nm, while the 180cc engine produces 17.3PS/15.5Nm. The TVS Apache RTR 160, 180 and 180 ABS are priced at Rs 72,000, Rs 76,400 and Rs 87,090, ex-Delhi respectively. The TVS Apache has held the attention of enthusiasts for a long time in India. However with the advent of fresh competition, the motorcycle lost its sheen. There have been no significant updates to the motorcycle since its launch as well.